Best Family Road Trip Destinations in the U.S. Authored by Angie Morris of Justmeandmypeeps.com. As soon as the kids are out of school for the summer, families start heading out on road trips around the country. A road trip is an affordable way for a family to experience new places and activities together. It also offers opportunities to see multiple locations in one trip. The perfect family road trip includes one or more of the top U.S. cities for family travel, plus a few smaller towns and attractions along the way. You may be planning to do the trip in your family car, but another fun way to do a road trip in the United States is in an RV rental. There are many parks throughout the country where you can park for the night or stay for a week if you want, while you’re enjoying the countryside. To get started planning a great summer family road trip, check out these exciting destinations. Plan to stay for a night or two in any of these cities to build an educational and exciting trip the whole family will enjoy. And don’t forget to check out this packing list before you go! Washington, D.C., tops the list of the best stops on a family road trip. It’s a favorite with families because it’s both awe-inspiring and engaging. The nation’s capital has many museums and monuments, and most of them are free to visit. You can spend more than a few days visiting Smithsonian museums, seeing the Jefferson and Washington memorials, learning about printing and engraving money, and expanding your knowledge of American history. A tour through the Capitol Building or the White HOuse, a walk along the National Mall, and a stroll through the cherry blossoms at the Tidal Basin in spring are among the activities that families enjoy the most in Washington, D.C.
⇒ Check out our guide with the top 50 things to do in Washington. The west coast of the United States is one of the best places for a roadtrip because the entire stretch of the road – Highway 1 – extends all the way from Canada to Mexico, with plenty of incredible side stops in between, like Seattle, Astoria, Newport, San Francsico, and San Diego. A road trip is the best way to see the splendor of nature along this stretch of road. Keep your eyes peeled for sea lions and whales in the ocean, and towering rock formations all along the coast. Check out this detailed road trip guide for everything you need to know about taking a road trip along the west coast. Savannah, Georgia, is a fun and interesting place to visit, as it’s full of Southern charm. There are cobblestone streets, enormous oak trees covered in moss, and picturesque antebellum mansions that will give you a glimpse into the historic past of the Southern United States. You can take a riverboat cruise, rent bikes and tour around the historic city, and even relax on the nearby sandy beaches. A city unlike any other in the Unites States, New Orleans is known for its mix of African, French, and Southern culture; its unique food; and its vibrant music scene. You can learn a lot about the different cultures, familiarize yourself with Cajun and Creole cuisine, and enjoy the lively atmosphere. However, you may want to steer clear of Bourbon Street with kids. 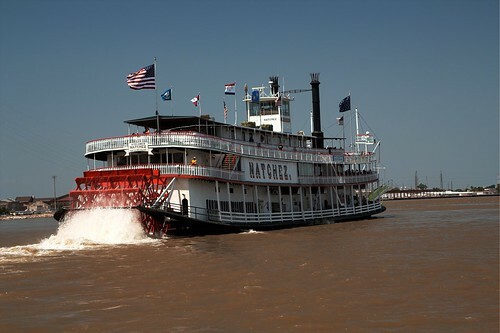 A paddle wheel steamboat tour along the Mississippi River is a highlight of any visit to New Orleans. Phoenix, Arizona, is a great city to add to a family road trip to discover the Southwest. Phoenix is known for its year-round sun and long, warm days. It’s perfect for mountain biking, hiking, and exploring the cactus-filled desert landscape. Moms will love the spa resorts, where relaxation is high on the list of things to do. It’s not all about outdoor activities in Phoenix, however. There are many museums, shopping districts, and art galleries to add variety to your itinerary. Visiting these fascinating cities during your family road trip is a great way to spend a summer, enjoy coveted family time, and learn a lot along the way. You’ll see many parts of the United States, learn a lot about American history, and build many lasting memories. Angie is a mom of 2 lovely teenagers. She’s been traveling with her kids since they were just little peeps. She shares information and tips about traveling with kids on her blog Justmeandmypeeps.com. This entry was posted in Attractions and tagged USA.